GEFFS strives to improve its equipment with the most state of the art designs and products. The advent of faster and smaller control units allows GEFFS to provide an improved "Computer Rate Control System" in 2012. Our engineering department has designed the spreader to meet the demands of the EPA and still provide a machine that is easily maintained. We have also taken on rebuilding steps and designed a re-power program to allow customers with older machines receive diesel engine, automatic transmission and hydraulic systems with rate control abilities similar to the newer chip spreaders. We are located in The Historic Paul Robert’s machine shop building in Old Town Pocatello, Idaho. Back in the early 1940's, if a contractor got a job to resurface a road, he would most likely have to cover the oil coat with gravel distributed through a spreader attached to the back of a dumptruck and pushed backwards over the oil. The system worked, but there were several obvious drawbacks. The primary problem came from having to back a dumptruck while pushing the spreader box.. All this had to be accomplished while making certain that the gravel chips went on the oiled road before the spreader wheels and truck wheels ran in the oil. The process was made even more difficult because the old Buckeye spreaders had only one set of wheels under them, and it took four healthy men to hold them upright when trucks were exchanged. During the winter of 1942, Willard Horner was busy repairing tailgate spreaders when he got an idea that revolutionized the road building industry. His idea was to build a machine that put the box in front, ahead of the wheels, and pulled the dump truck backwards behind it. Horner took his idea to the shop's owner, a local contractor and they decided to go ahead and build one and try it out. The machine was an instant success, and using the new machine, the contractor soon became the most efficient sealcoater in the area. As World War II continued to heat up, interest in more efficient highway surfacing machinery gave way to more important concerns, and it was not until the early 50's that Horner's invention got an opportunity to perform for a national audience. The postwar economic boom spurred an ambitious road-building program which created a demand for better ways for contractors to build and repair highways. 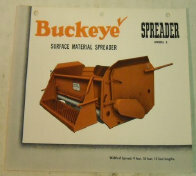 In 1954, Gene Flaherty hired Willard Horner and set up Flaherty Manufacturing Co. to produce and sell Horner's chip spreader mounted on a Minneapolis Moline Tractor. 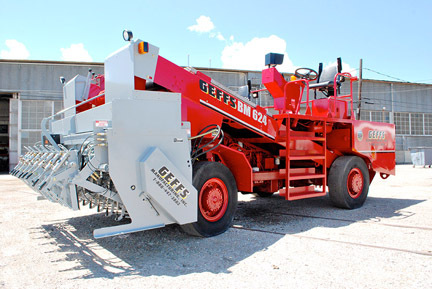 The machine was so much more productive than the previous spreaders that it became an instant hit with busy contractors and soon over one hundred units a year were rolling off the line at the Flaherty Plant in Pocatello, Idaho. 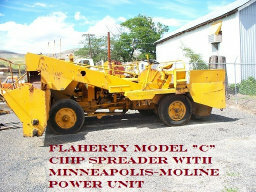 Within a few years a nationwide network of dealers marketed the Flaherty Model C designed by Horner who was now the plant Superintendent. Business was brisk as the Interstate Highway project got in to full swing during the sixties and Flaherty Mfg. prospered in Pocatello until Gene Flaherty's retirement in 1968. 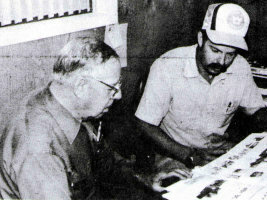 The parent corporation which had acquired controlling interest in 1959 decided to move the Pocatello operation to Ohio. Employees in Pocatello had the option of going with the company to Ohio, but more of Flaherty's people in management than labor accepted. Most employees looked for other work in the Pocatello area. Within a year, Horner was in direct competition with his former employer, and his company. W.H. Manufacturing quickly established itself as the third chip spreader manufacturer in the marketplace. Flaherty, the original name has been sold to other companies since 1968 and Horner estimates that W.H. still sells about 90% of the replacement parts for the Flaherty machines. When Horner first set up W.H. Mfg. back in 1969, his chip spreader was nearly identical to those made by his two competitors, but within a few years, the machines began to evolve and the differences among them grew greater as each company sought to build a better machine. 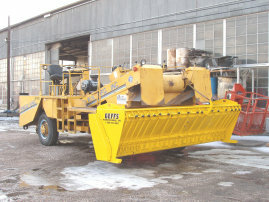 While the other two companies pursued hydraulics, W.H. Mfg. chose to go with a piston driven hydrostatic system for a smoother, more positive delivery of gravel to the roadbed. Horner also felt that his machines could achieve a higher level of productivity if they were equipped with more powerful engines, so he began building spreaders with diesel engines generating about 200 Hp. “The big secret with chip spreaders is to have the hopper drive constant with the ground speed, so you get an even distribution of gravel.” stated Horner. “With hydrostatics, we get a more positive control over the conveyors and hopper. The big advantage of greater horsepower is it allows the operator to bring the machine and the truck to maximum speed before he opens the metering gates, so he can get an even spread on every load. If the engine is too small, it will lug down. A larger engine gave ample power to come back to the same ground speed every time it hooks onto a truck.” The greater horsepower allows the operator of the machine to idle down while hooking onto a truck without losing power to run the conveyor. The extra power also comes in handy when the engine is called upon to haul an 18,000 lb. machine loaded with another 18,000 lbs. of gravel and pulling 45,000 lbs. of truck up a four or five percent grade. Two other changes cited by Horner have given his machines a performance edge. The first change was in the design of the gate through which the gravel is delivered to the roadway. As Horner explained it, “Our gate just falls open, gravity takes care of that, and we have a lever to pull it shut. There's no friction to prevent it from sliding shut.” Every once in a while they get a rock jammed in there, and they have to go back and scoop up the gravel that got dumped after the gate was supposed to be shut. The other major improvement Horner pointed to was made to help keep the machine on the job longer. “We use structural tubing in the main frame” he commented. “It's nearly impossible to twist if you're loading one side of the machine more than the other.” That kind of ruggedness is important on equipment handling the kind of power and weight demands Horner's machines must take. One crucial component on Horner's chip spreaders has remained the same for over 20 years and very well may remain the same for 20 more. “Our drive axle is a Rockwell Standard Planetary axle,” said Horner. “I've used it since 1962.” Despite the considerable time and effort put forth by Horner and his son to find ways to improve their chip spreaders it took a nudge from a customer to get them to put a Caterpillar engine in one. Nowadays, most of the machines have the Cat engines in them. 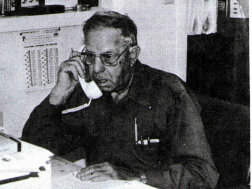 In 1980, W.H. Mfg. introduced the “Big Boy” with a hopper wide enough to sealcoat interstate highways in two passes instead of three. This improvement not only increased contractor productivity dramatically, but it also eliminated the seam in the traffic lanes which occurred with the smaller machines. 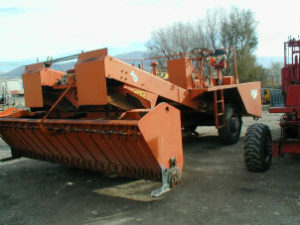 The 16 foot hopper is now available on both the small machines and the bigger equipment. The WBH has proven to be a hit in areas of the world where rough mountainous terrain is the norm. In recent years, as other countries have developed and grown more and more dependent on their highway systems, the market for chip spreaders has become international. Today we sell our machines all over the world. It wasn't until the late 1990's that the company was acquired by five investors and the name was changed to GEFFS Manufacturing, Inc. The name represents the first initial of the last name of each investor. From pioneering this technology four decades ago to our present state of the art computerized application rate system (C.A.R.S.) with a variable width or expandable front hopper and individual gate control, we have made a commitment to provide our customers with productive and reliable products and service. In 2002, the company was acquired by a well-known Pocatello businessman, Jeffery L. Matkin. This brought great confusion on the name spelling of the company. With the advice of - George Kayle Matkin and Louis Gordon, the company was purchased. GEFFS Manufacturing, Inc continues to provide great service and quality equipment. Our products will always maintain the principles from the 60 years of dedication to our customers worldwide. !!! In loving memory of all those "George Kayle Matkin, Louis Gordon, and Willard Horner" who helped to make GEFFS Manufacturing the company it is today!! !